This is the quilt I slept under Saturday night, at my future MIL’s home. 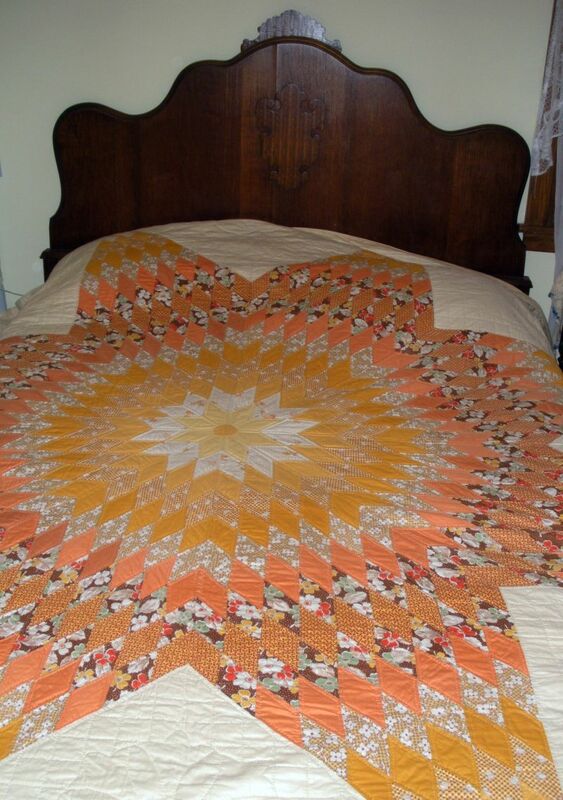 It’s a beautiful 1930s Lone Star Quilt, made by her Auntie Bea and a group of quilting friends in River Falls, Wisconsin. It is in shades of yellow, goldenrod, tangerine and mocha solids, with floral prints alternating every other row. It’s in amazing condition, I suspect it has been stored more than it has been used over the last 80 years. At my coaxing, when she first showed it to me over a year ago, she took it out of the box and has it proudly displayed on her guest room bed now. It’s beauty cannot be enjoyed when it’s wrapped in tissue in a box, and since this bedroom doesn’t get any direct sunlight, it’s a safe place to display the quilt. 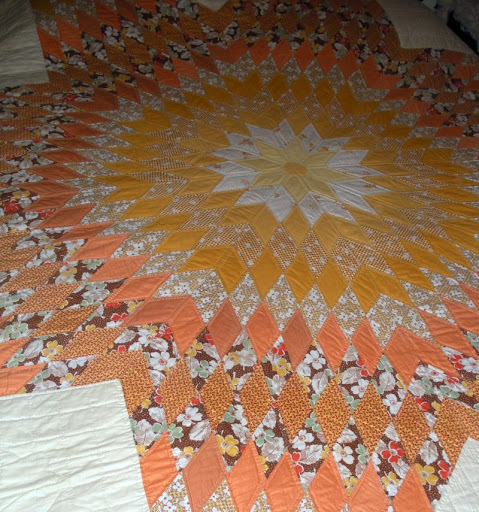 The Lone Star quilt is one of the most recognizable, and oldest American quilt patterns. It’s also one of the hardest to master, especially at the time when this one was made, before rotary cutters, plexiglas templates and rulers, or Accu-cut machines. This would have been made with a hand-drawn and hand cut paper or cardboard template, each diamond-shaped piece individually traced onto fabric and cut out with a scissors. Getting precise points, intersections, and seams like this one has, would have been difficult, if not nearly impossible. 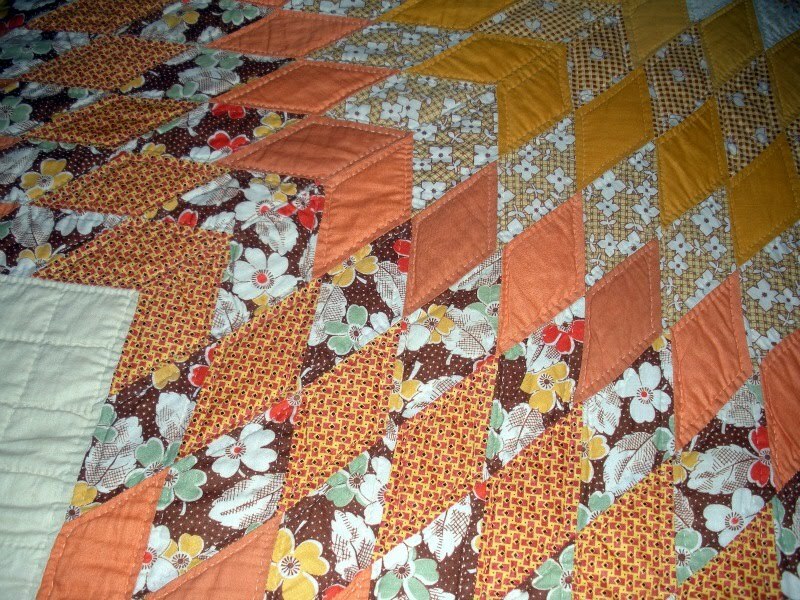 The makers of this quilt, Auntie Bea and her friends, were obviously skilled and experienced quilters. It appears to have been machine pieced, but hand quilted. Maybe someday I can take it outdoors and get some better pics of it. I’m not sure what it measures, but that is a full-size (double) bed in the photo. It is a very large star, and the star is the entire design, as the quilt has no borders on it. Just guessing, it is probably 90″ square. 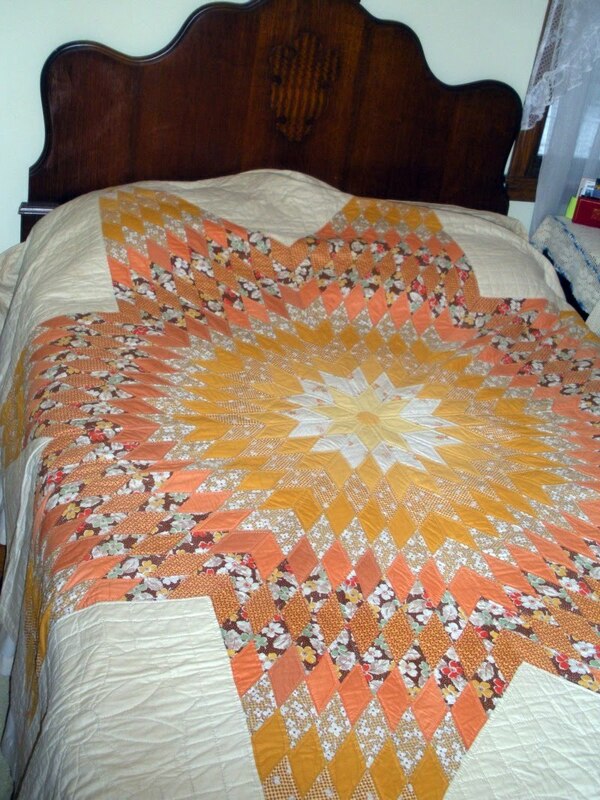 You can read more about the history of this quilt pattern here. Really, “Aunt Bea”? Like from “Mayberry”? How delightful is that?! 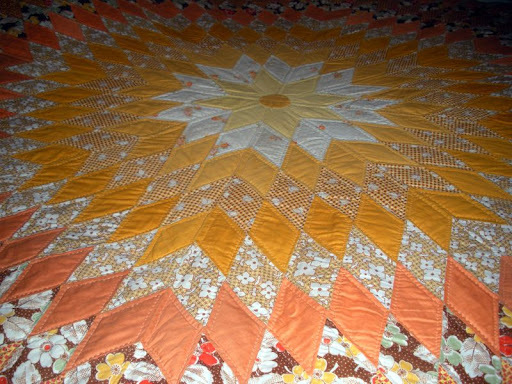 The quilt is stunning. The Lone Star isn't a favorite design of mine, but I can definitely appreciate the intricacies of making it. I HAVE seen one that wasn't well pieced, and it had a big, poochy bubble in the center. Your almost-MIL's is gorgeous. Thanks for sharing! That is a real beauty and I'll bet you enjoyed spending time under it.